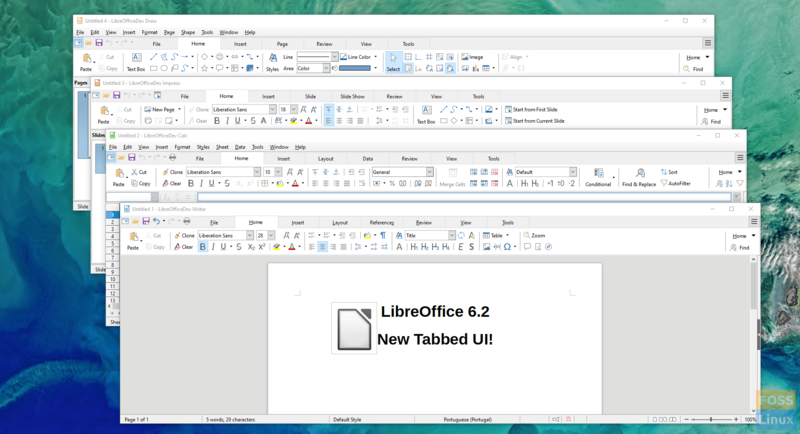 The latest version of LibreOffice (i.e., v6.2) — released on 7th of February of the current year — comes with an improved UI and several new features, of which NotebookBar is the most noteworthy. LibreOffice is one of the most popular open-source office suites available in the market right now. With this release, it has the potential to overtake more of its competitors. The Document Foundation has covered a lot of its features in the release notes link located at the bottom of the article, which we will be shedding light upon now. It was clear from the headline of this article that major UI improvements are part of this new release. With Libre Office v6.2, you can now have SVG-based icons for your toolbars, which will benefit those using HiDPI displays. The Breeze, Colibre and Elementary icon sets also got revamped, as they now contain more icons for your liking. The recent LibreOffice update also comes with a tabbed UI, which the company refers to as NotebookBar. This feature was experimental in its previous releases but now has been made permanent. Although it is really an impactful feature, users do not get it by default. For enabling NotebookBar, you will have to open the View menu and select User Interface from it. For those users who weren’t fascinated by this feature, LibreOffice 6.2 also offers two other modes: Contextual and Grouped. Apart from all the UI improvements, the new version comes with better support for different file formats as well. You will notice that EMF+ vector images have been significantly improved, as you can now underline, rotate and do much more with them. Moreover, LibreOffice Impress can now handle animation in a better way. The development team has not put the performance in jeopardy for these UI improvements. In fact, LibreOffice v6.2 is expected to perform even better than before. In the new LibreOffice, users will get reduced latency, enhanced pre-initialization hooks, and lighter chroot jails. Users will also not be annoyed by pointless animations and repeated red-lines and comments. This version of LibreOffice comes with a bunch of other improvements and bug-fixes. Users of this software will now be able to open PDF files in a new tab, better track changes, and easily handle the cursor. Not only that but the developers have also enhanced cache handling, allowed frame-ancestors, and scroll-wheel behavior. Undoubtedly, the development team has really outdone themselves with this release. However, we cannot make any conclusions about it before seeing its reception. LibreOffice is available in most of the Linux distro’s App store. Although the new version will take some time to propagate through the official repos, you can download the LibreOffice 6.2 now if you want.